The girls and I got the chance to read the book Abraham’s Journey: A Celebration of the American Dream by Robert and Kathleen Basmadjian. 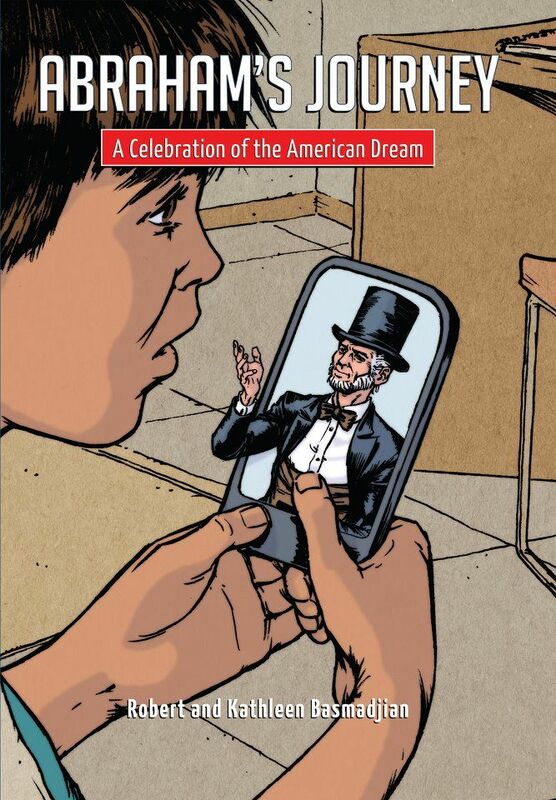 The book sells for $14.99 at Inspiring the American Dream website and is aimed to children aged 7-12. I got to read this book with my 2 beauty queens and 1 king. It has been really cold here so we all snuggled up on the bed together and I read the book out loud to the kids. My oldest is a great reader but my the other two can't read yet and I thought they still might enjoy hearing it in the background. Because who doesn't love a good story time?! Not to mention anytime we can school from bed we never pass it up. This book came to us just after our celebration of presidents day. I was really excited as the site said it was going to be about Abraham and his journey through a tough time of his parents losing their jobs and him wanting to help out in time for Christmas. While reading to the kids I had to stop and think a bit. It was confusing how there were things in it that did not add up. For example a poor kid that had a smartphone, in which he used to travel back in time. My kids picked up on this because they know phones are expensive and not toys. We thought this book was going to be more true to life instead more make believe. It has a true life feel but also a magical aspect as well. The good about the book was that it gives a goal for kids. They are able to see there are problems in the world and if we work at it and try we can make it through those problems. I have always told my kids and the book even stated it, where there is a will there is a way. This book showed the steps he was taking to look for work to earn money to help his family out. They used historical figures to help Abraham on his journey in helping his family. The end of the book did give definitions of words and people that may not be known to the kids. This was great for my girls since they are still young and learning these things. I also got to use the words and some vocabulary words for my oldest daughter. Overall I loved the concept of the book and how it teaches us to work for what we want. I just wish it had more realistic settings for it. Even for the age group it is aimed for is also the age of questions and when they see things like a kid having a smartphone but no money they get stuck on that fact instead of the overall point of the book. I think the magical feel to books that are trying to talk about real things is not for the latter part of the age range. Although they did like and pointed out the fact that even when he helped his family he didn't stop there, he also helped out others that were in hard times like the orphans. Disclaimer: I received a free copy of this product through the Schoolhouse review crew in exchange for my honest review. I was not required to write a positive nor was I compensated in any other way. All opinions I have expressed are my own or those of my family. I am disclosing this in accordance with the FTC Regulations. Stopping by from the Crew! Blessings! As the illustrator of Abraham's Journey, I just want to thank you for taking the time to read and review the book. I'll be taking your comments into consideration on future projects--hopefully making them even more entertaining and informative for your children.